A continuous performance management culture boosts revenue by 70% - so how can you build a culture of it to maximize growth? Download this brief to discover the benefits to creating a culture of continuous performance management. 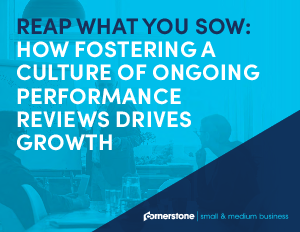 90% of employees think annual reviews aren’t accurate, so how can managers flip the script and deliver more meaningful, growth-focused performance evaluations? Learn why making performance management a continuous process, not a yearly or semi-yearly one, leads to more revenue and a more powerful workforce.